A £2.6million resurfacing programme to improve 32 roads in the Borders this financial year moves onto Innerleithen High Street next week. The convoy system will be in operation between 9am and 4.30pm. Parking restrictions will be in place from 8.30am to 5pm on the High Street. The works will take place in two phases, with staff on site to assist with traffic management and deliveries to local businesses where practically possible. The resurfacing programme was boosted by an additional £1.8million committed by our Administration in this year’s budget, which means 32 key town and village routes could be included. “This latest resurfacing project will be welcomed by users of the A72 road and Innerleithen residents, with the busy road showing signs of wear and tear from previous severe weather and the high number of vehicles which use it. “With Dirtpot Corner improvement scheme currently ongoing with traffic lights in use, I would encourage anyone using the A72 to give themselves extra time during the vital Innerleithen High Street works. “The Council is committed to investing over £22million in roads and bridges over the next three years, with £79m planned investment over the next ten years. “The Council recognises the importance of our roads network to the Borders, particularly after the extensive damage caused by the Beast from the East in February/March this year. 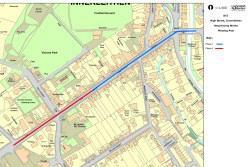 An image of the resurfacing plan is available on our Flickr page.